Wooper in game: 5,052 Who? Important notice! Pokemon Wooper is a fictional character of humans. Wooper made its anime debut in No Big Woop! Ash, Misty, and Brock volunteer to watch over Olesia's school of Wooper for her. A gang of Wooper appeared in Pikachu & Pichu. 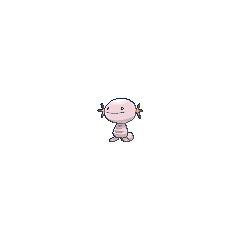 A Wooper is one of the best friends of the two Pichu Brothers. It has appeared in Pikachu and Pichu, Trouble in Big Town, Of Meowth and Pokémon, Big Meowth, Little Dreams, Pichu Bros. in Party Panic and made a cameo appearance in Giratina and the Sky Warrior. A Wooper was also one of the Pokémon that Ash and his friends were taking care of while Nurse Joy was ill in Pinch Healing!. 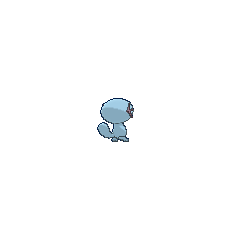 A Wooper also made an appearance in Like It Or Lup It!. Another Wooper appeared under the ownership of Leona's parents in Hot Springing a Leak!. Multiple Wooper appeared in flashbacks in A Slippery Encounter!, One for the Goomy!, An Oasis of Hope! and Good Friends, Great Training!. One of these Wooper was close friends with Goodra when they lived together in the wetlands between Lumiose City and Laverre City. This Wooper, along with the others in its group, appeared in person in Defending the Homeland! and Beyond the Rainbow! where it was captured by Florges's Bug-type and Poison-type Army along with Pikachu and Dedenne to bring them to Team Rocket. They reappeared in Master Class is in Session! and Performing a Pathway to the Future! to watch Serena's performance with the rest of the wetland Pokémon. They appeared once again in A Diamond in the Rough! when Ash and his friends returned to the wetlands. Four of them appeared again in Till We Compete Again!, where one of them was fighting with a Lotad, before Goodra settled the argument. A Trainer used a Wooper in Hook, Line, and Stinker to aid him in the annual Seaking Catching Competition. A Wooper appeared in Beauty and the Breeder where it participated in a Pokémon Beauty Contest. A Wooper appeared on a poster in Imitation Confrontation. A Wooper was one of the Pokémon living at Temacu's father's lab in The Heartbreak of Brock. Five Wooper were among the inhabitants of an oasis just for Pokémon in Got Miltank?. A Wooper was under the ownership of a Trainer who was waiting in line to register for the Whirl Cup in Octillery The Outcast. A pair of baby Wooper were shown in the pond at Mr. Shellby's house in Extreme Pokémon!. Two Wooper were seen at a Pokémon Center in The Legend of Thunder!. In Why? Why Not! Team Rocket thought a Wooper took Ash's Badges so they looked for one in order to steal the Badges. A Wooper was used by one of the students of the Pokémon Trainer's School in Gonna Rule The School!. 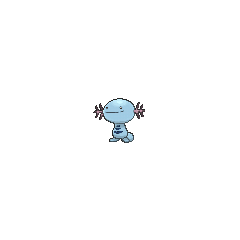 A Wooper appeared in Abandon Ship!. A couple of Wooper were seen in the greenhouse in Sweet Baby James. Multiple Wooper were owned by a family of traveling circus performers in Pokémon Ranger and the Temple of the Sea. A Wooper appeared in the opening of Lucario and the Mystery of Mew. Several Wooper appeared in Pokémon Ranger and the Temple of the Sea. Several Wooper and a Quagsire made an appearance in The Rise of Darkrai. A Wooper also appeared in A Lean, Mean, Team Rocket Machine. A Wooper also appeared in To Thine Own Pokémon Be True!. A Wooper also appeared in Bagged Then Tagged!. A Wooper belonging to a Coordinator appeared in Yes in Dee Dee, It's Dawn!. It was used along with a Snorlax for the Double Performance required during the DaybreakContest. Wooper appeared in Zoroark: Master of Illusions. A Wooper appeared in The Island of Illusions!. A group of Wooper also appeared in Genesect and the Legend Awakened at Pokémon Hills. A Wooper appeared in Alexa's magazine in The Journalist from Another Region!. Multiple Wooper appeared in Going for the Gold!. A Trainer's Wooper appeared in Summer of Discovery!, Foggy Pokémon Orienteering! and Battling Into the Hall of Fame!. A Wooper appeared in Pikachu and the Pokémon Music Squad. A Wooper appeared in SM003, as an icon on the Rotom Pokédex. Several wild Wooper appeared in a river in Ecruteak City in The Adventure. Pikachu attempted to attack the Wooper with Thunder Shock from a tree above, but it was ineffective due to their immunity to electricity. The Wooper strike back with Mud Shot, sending Pikachu flying. Wooper made a cameo in The Legend where one was seen by the lake when Green had finished her message to Silver in Johto. Wooper formally debuts in Murkrow Row where it was seen as one of the Pokémon in Joey's bag after Gold helped him get it back. In Who Gives a Hoothoot?, a conman uses a swarm of Wooper as a part of his game stall, however after Gold and Aibo had revealed his secret to the crowd, they were possibly boxed or released. In the Goldenrod Game Corner a trainer seen with a Wooper in Gligar Glide, strangley this Wooper has arms. A Wooper is seen as one of the Pokémon at Earl's Pokémon Academy in Violet City in Slugging It Out With Slugma. 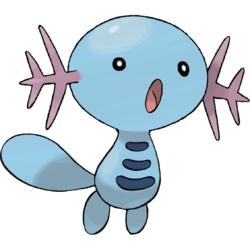 A Wooper was one of the Pokémon sent to help the fight in Ilex Forest in The Last Battle XIII. In The Final Battle V, during the Trick Master's story of the homeland soil, a Wooper appeared in the flashback when it was one of the Pokémon calmed down by it. Shū has a Wooper in the Pokémon Gotta Catch 'Em All manga. Wooper has the lowest base stat total of all Ground-type Pokémon. This includes the lowest base Special Defense among Ground-type Pokémon. The blue Pokémon mini was modeled after Wooper. Wooper seems to be based on a larval salamander, which has a flat tail and feathery, external gills. Its Shiny sprite gives it a similar coloration to that of albino, leucistic, and flavistic color mutants. 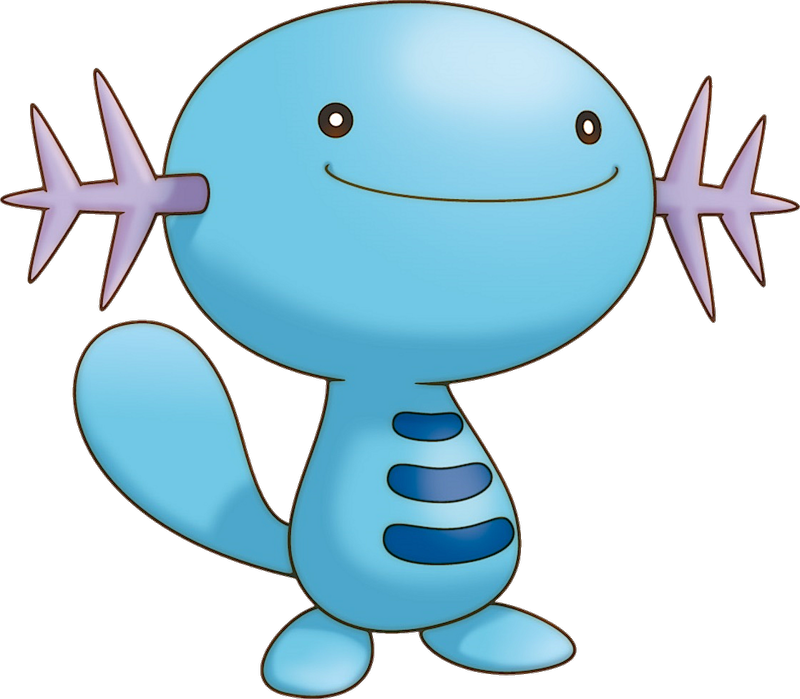 Wooper and Upah are derived from wooper looper, a marketing term found in Japan that started a pet salamander raising fad. Wooper loopers are the Japanese term for the axolotl, a species of salamander.